Cone got a late start into college due to Army service during World War II. As the starting fullback, he led Clemson in rushing with 703 yards in 1948 and followed up with 845 yards in ’49. He was chosen by the Packers in the third round of the 1951 NFL draft. He handled kickoffs in college and took over placekicking duty with Green Bay. He connected on 5 of 7 field goal attempts as a rookie in 1951 and was 29 of 35 on PATs to go along with one rushing TD to end up with a total of50 points. As a rusher Cone gained 190 yards on 56 attempts (3.4 avg.) and he added another 315 yards on 28 pass receptions.He remained strictly a backup fullback and gained 276 rushing yards in 1952 and 301 in ’53.As a kicker he was successful on just one attempt in 1952 while booting 32 PATs and in1953 hit on 5 of 16 field goal tries and added 27 extra points. His rushing total dropped to 18 yards on 15 carries in 1954 and he made good on 9 of 16 field goals as well as 27 extra points. Packers went 6-6 to finish third in the NFL Western Conference. 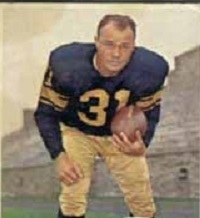 Cone spent one more year with the Packers in 1957 and connected on12 of 17 field goal attempts and all 26 of his PATs.He also rushed for 135 yards and two touchdowns. Cone became a high school coach before signing with the expansion Dallas Cowboys in 1960.He kicked 6 field goals out of 13 attempts in his single season with Dallas as well as 21 PATs and was let go the following preseason. For his career with the Packers Cone ran for 1156 yards on 347 attempts (3.3 avg.) and caught 75 passes for another 852 yards. He made good on 53 of 89 field goal attempts and added 221 extra points which, along with 16 TDs, gave him a total of 455 points. Cone was a 1974 inductee into the Green Bay Packers Hall of Fame and also was inducted into the Clemson and South Carolina Athletic Halls of Fame.